Powerhead is a band that tote themselves as doom metal, and while this is accurate, I think it needs to go a bit further. I see them as a melding of genres, sort of a 'doom n' roll' band. I say this only because, while they do have the elements of doom, they also have very up-beat and uplifting sections, which - if you are a true believer of doom as I - you know is not a staple of the doom genre. The first song off of their album Celestial Frankenstein, "Spinal Spiral," is a perfect example of this; the guitars play a droning, doom/stoner rhythm (read: slow and few), while the lyrics and drums seems to be apart of a traditional metal band. At the end of the songs, all elements of doom are forgotten as the group goes into a grove metal beat; to me it sounded like the beginning of a new songs, and I was surprised that this 'new song' only lasted a minute or so, it was then that I saw it was the climax of the first track. It actually worked quite well. The entire album follows the example of "Spinal Spiral," moving from a semi-doom song into a straight rock/metal song and back again, with varying success. Stand-outs are "Spinal Spiral," "Come Undone." "Celestial Frankenstein," and "The Zone," with the rest being nothing special. Even these songs aren't anything wholly amazing, they just stand ahead. This is another band that shows promise, some of their songs are good, and some need work, but they have an interesting view of an old genre. Hell if we can have death 'n roll why can't we have the doom equivalent? 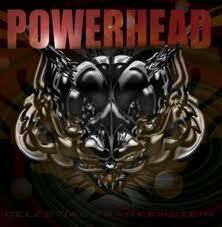 I look forward to seeing what the next release from Powerhead will be (although with a name like Powerhead I definitely expected some power metal or something, I'm just saying), and to see first-hand how they continue to meld, what seems to be, their own genre.